How do you deal with uncomfortable situations in your work and career? Kathy Dixon wants to inspire you to lean into discomfort. The more she embraced discomfort, the more she found growth and opportunities to do work that worked for her. We met at the Startup Leadership event in DC and sat on a panel together and immediately hit it off. She also considers herself an accidental entrepreneur like myself. 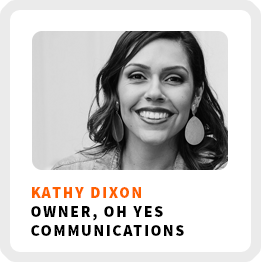 Kathy is the owner and creative director of Oh Yes Communications. She loves working works with specific clients with big, bold ideas to help them craft their messaging and brand. How clearly she defines her target customer. Process she went through to overcome imposter syndrome. How to put yourself in situations where you don’t know the answers. Creating alignment to stay true to your brand. Feeling relieved after losing a job she didn’t want to quit. Core work activities + habits: 1) Communication with her team. 2) Choosing her top priorities for the day. 3) Having 2-3 key confidants or mentors in the business world to ping things off of frequently. Superpower: Encouraging others and getting past their limitations or self-doubt. Regains focus by: Journaling with a brain dump. 90-day goal: Shift the company’s messaging towards marketing and branding. 1) Evaluate how long you’ve been thinking about your idea. 2) Acknowledge that at some point, something has to give. The pain of not acting will outweigh the pain of trying it. 3) Believe in yourself and go for it.